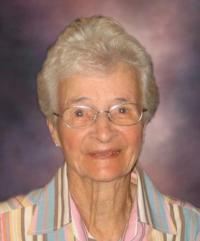 On August 9, 2013 Janet passed away in Edmonton at the age of 98. Janet will be remembered by her daughter, Janet Anne (Jack) Scott; grandchildren, Jill (Christophe) and Rob (Kathy). Janet will also be missed by her four great-grandchildren and extended family and friends. She was predeceased by her first husband Scottie (E.L.) St. Clair, her second husband Nelson Miller as well as her son, Wayne. Her family will remember Janet’s love of gardening, crafts and sewing, her particular affection for her grandchildren and stories of immigration to Canada from Scotland. A Remembrance Gathering will be held at Lacombe Memorial Centre, 5115 – 50 Avenue, Lacombe between 2-4:00 p.m. on Saturday, September 7, 2013. In lieu flowers, donations in Janet’s name can be made to the Alzheimer Society of Alberta, 15031 Kingsway Avenue, Edmonton, AB, T5H 4K1.